Our Private Whale Watching Charters are great for friends, families and photographer who would like to have one of our three vessels to themselves. Our private whale watching charters are 4 hours induration. 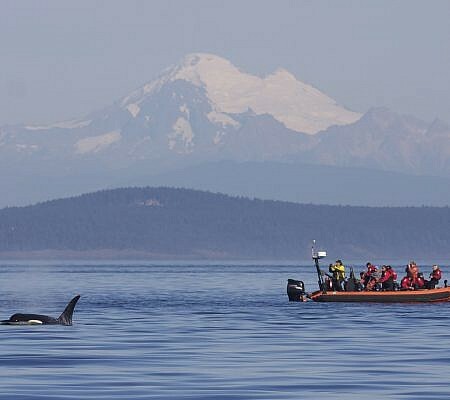 Our private charters give your group the flexibility to experience the whales and wildlife of the Salish Sea on your own schedule. 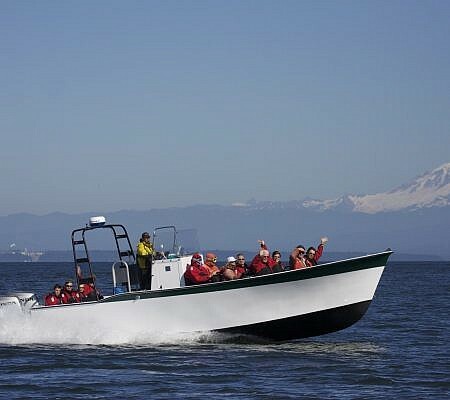 Our vessels can take a maximum of 12 of your closest family and friends to meet our Southern Resident Killer Whales, Transient Killer Whales, Humpback Whales, Sea Lions, Harbour Seals, Bald eagles and a myriad of marine birds. We use three different vessels for our 4 hour whale watching private charters. All our vessels vary a little in style and cost. Taku is the largest vessel in our fleet. She is 11 meters in length and has space for you to move around. She is the most popular vessel for whale watching photography charters as she is extremely stable in all conditions. Taku has a small onboard washroom and seats a maximum of 12 passengers. Skana is our newest and fastest vessel designed especially for Whale Watching, Wildlife viewing and photography. She is truly a 4X4 of the sea! Fast, stable and extremely safe. She is our go to vessel for film crews and extended photography tours. Skana has a small onboard washroom and seats a maximum of 12 passengers. Neptune is our smallest Vessel in our fleet but one of our captains favourite vessels. She is extremely fast and nimble and a favourite for photographers and adventurers. As she is so close to the water one feels completely in tune with the whales and wildlife. There is no washroom on Neptune but bathroom stops are available in most areas. Neptune seats a maximum of 12 passengers.